Borders panels make a great versatile open space while still providing privacy. Available in 12, 24, and 36 inch heights and different glass and fabric options. 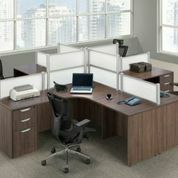 Can be mounted to your existing desks or panels for more height or privacy.